Advertising-supported applications are very sneaky and might seem that they have appeared on the system out of nowhere. DownSavie is one of them and it is very likely that users install it without wanting to do that. You might wonder how it is even possible; however, you should just know that the majority of undesirable programs travel bundled with unrelated software. Have you already detected DownSavie on your system? If so, you should hurry to erase DownSavie because this program is not only unreliable, but might also attract different kinds of suspicious applications onto your computer. Believe us, it is better not to keep it on the system because there are other much more reliable programs out there. DownSavie displays commercial advertisements on Internet Explorer, Google Chrome, and Mozilla Firefox browsers. Actually, it is the main reason why we recommend that you erase it from the system. Even though the program is not very active, you might still infect your system with it and start seeing ads. Do not click on them in any way because they might take you to corrupted websites. Beware of such programs as LuckyCoupon, SaveNShop, SaveON, and RealDeal as well because they do not differ from DownSavie. It means that they will just show ads instead of helping you to save some money on ebay.com, amazon.com, walmart.com, and similar websites. 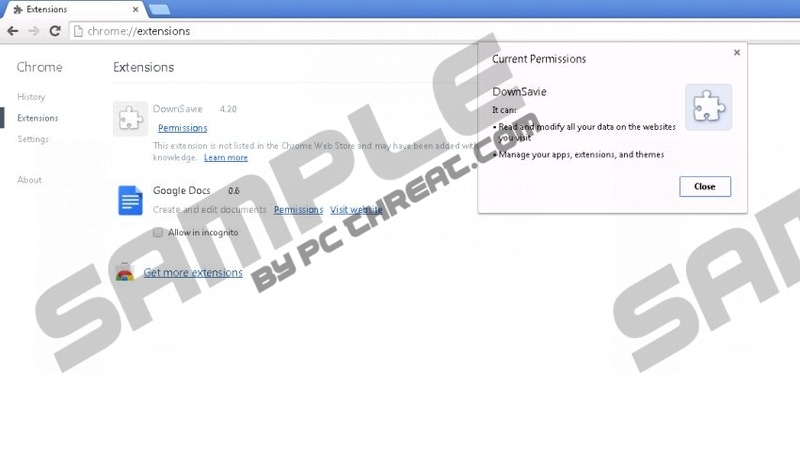 The researchers of pcthreat.com have found out that DownSavie might randomize its name. Thus, it might appear on your system as DownSSavee, DoiwnSavE or even DowNSaavvE. Of course, it might use another similar name as well; thus, it might be difficult to detect it and remove it manually. Therefore, we recommend that you acquire an automatic malware remover, for instance, SpyHunter. Scan the system with it and then just click the Fix Threats button. Tap the Windows key to access the menu. Find the program that you want to remove and then Remove it. Quick & tested solution for DownSavie removal.